The 48HD cross-stream coal system in the field in Arizona. The decisions mines need to make when it comes to sampling systems can quickly overwhelm, from the number of stages the ideal system should have to whether automation is the best decision. The type of mining being performed, of course, has a role in the consideration, as is the location where the system will be placed to provide the best results. Once in use, the system’s efficiency or lack thereof can leave mine management happy they made the right choice or regretting ever having made the call. 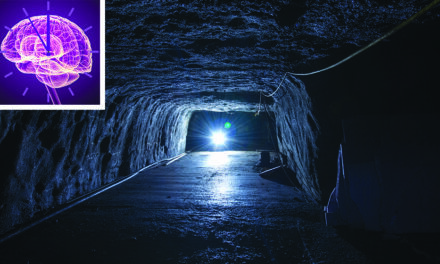 According to McLanahan Corp., the Pennsylvania-based equipment manufacturer of HSS sampling systems, mines need not make sampling system choices a mountainous task. Examining and evaluating the primary factors that are important to the specific mine site, and making the best match from that, is at the heart of it all. Sampling system division General Manager Jarrett Sidney said that a key to selecting the needed design layout of a mechanical sampling system lies in the knowledge that there are various ways to accomplish the ultimate objective of effectively collecting a sample. A number of issues must be addressed, then, before the request for quotations (RFQ) goes out to system original equipment manufacturers (OEMs), and there is no substitute for doing research in order to clearly spell out what a company wants from manufacturers. As the following features are presented, Sidney reminds operations that it is critical to be specific in the design application of said system, as it is a long-term decision. While it is obviously difficult — make that impossible — to test drive a sampling system, as one would a new automobile, Sidney suggested that mines do their homework and inspect existing sampling systems at applications that are similar to the conditions at the mine in question. Discussing the system’s performance with that owner and learning their experience will help provide a better picture of the positives and negatives of their own selection, he added. Additionally, he suggested to have a clear picture of the product or products the system will be sampling; be sure to think through the range of qualities (i.e., HGI and moisture content) and consignment sizes the system will face. From McLanahan’s viewpoint, it recommends a change in perspective; in other words, adopting the attitude that the system one is buying is mechanical, not automatic. Attention to detail in the selection process certainly pays off, so examining the design and components from multiple views is important. Being specific in the RFQ process, he said, not only offers the benefit of getting what one wants and needs for a specific site, it also makes the process of comparing quotations much more straightforward — apples-to-apples, as it were. “The manufacturers are trying to provide you with the lowest price,” Sidney said. McLanahan, he said, has long offered this type of education to the customer, from providing an overview of the many system applications to the various design options from which one can choose. Their staff has had many extensive discussions to help avoid what mines are ultimately fearful of — having made the wrong choice that leaves them in a costly spot with challenges and obstacles for which they were not prepared. The 48HD system working in lignite in Mississippi. All sampling standards, whether the International Organization for Standard-ization (ISO), American Society for Testing and Materials (ASTM) International, or an individual nation’s standard, recognize that the best time to collect the sample is when the material, in this case coal, is being moved from one location to another via conveyor belt, Sidney said. Doing so provides the best chance for any particles in the consignment to be selected for inclusion in the sample. The sampling standards also agree that the best way to collect sample increments is by stopping the moving conveyor under load and taking full cross-sections by collecting all the material, including lumps and fines, between two parallel planes with widths typically three times the nominal top size of the material. “This is the best way to ensure that the fundamental objective of sampling is achieved — which is that the size distribution in the sample is the same as the size distribution in the consignment,” Sidney said. He noted that the number of sample increments required to make up a full sample is large, so using the “stopped belt” method of sampling is not practical for day-to-day commerce or quality control. Looking at location, selecting the best place for the sampling system to reside is the first step but also a critical one. The system should be located as far “downstream” as possible so that all possible blending scenarios take place prior to reaching the sampling system, and potential plans for expansion or future changes in material handling characteristics and arrangements should also be taken into account. Again, when looking at location, access to the conveyor belt should also be evaluated. He said that an “ideal” location merges the idea of space availability on the conveyor for the primary sampler with the available ground space to locate the processing equipment. “Most modern sampling systems have very small footprints and are housed in standard cargo containers,” he said. “Access to the area by vehicle is very important,” adding that, in some site locations, electrical service availability can also present an issue. A factor that impacts cost and quality is the location of the primary sampler on the main conveyor. “If the primary sampler is located at a high elevation, then the length of the conveying system will be longer (and therefore more expensive) for both the sample material and the unused sample to be returned to the conveyor,” Sidney explained. Sites should also evaluate whether there is a conveyor belt scale on the main conveyor system, as the vibration from the primary sampler can have an impact on performance. As a result, it is best to locate the primary sampler on a different belt when possible. There is not a problem to locate them on the same belt, he said, but they should be spaced as far apart as possible (no less than 30 ft). 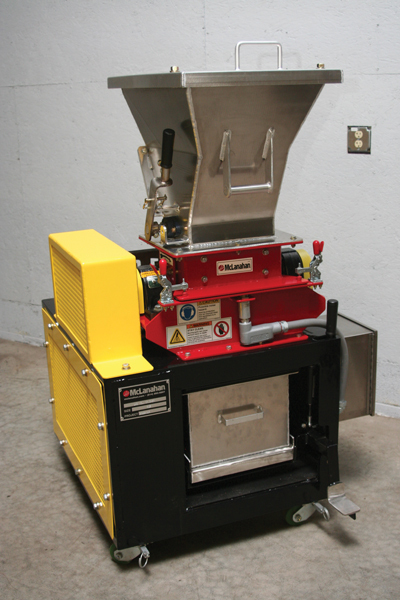 A full view of the LabMill crusher. There are two different popular designs to collect the primary increment, cross-streaming and cross-belt sampling. 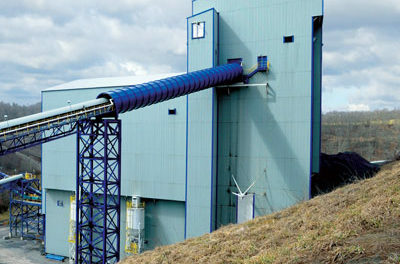 In the first method, a cross-section is collected from the falling coal stream at a transfer point between two conveyors; the second method of cross-belt sampling is performed by collecting the primary increment by sweeping the cross section from the material on a single conveyor belt. As Sidney noted, both designs work well at collecting a good primary increment when well maintained, but cross-belt samplers have several significant advantages. “Cross-belt samplers collect a much smaller mass of primary increment than do cross-stream samplers,” he said. On the other hand, cross-belt samplers can work very rapidly as they move through coal “laying” on the conveyor belt. In fact, he said, the faster the better in this case. “This means that the transit time through the coal stream is quick and less sample mass is collected. 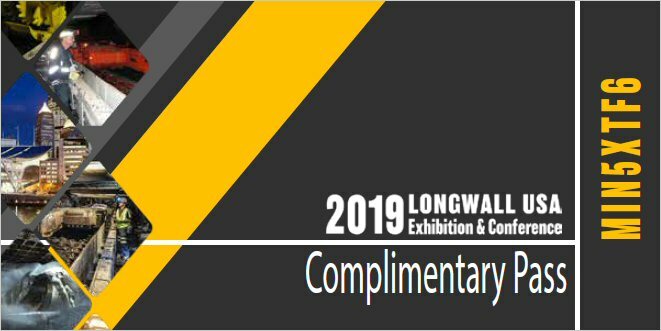 [For] example, the individual primary increments for a high flow rate sampling system can be easily more than 500 kilograms, while the commensurate cross-belt primary increment for the same flow rate could be well under 100 kilograms. This difference in primary increment mass translates into a significantly lower scale on the downstream material handling and processing components,” he said. Cross-belt samplers, which call for installation on top of a conveyor structure, therefore, do not require the additional needed engineering and construction to place primary samplers in the chute at the transfer point between the two conveyors. 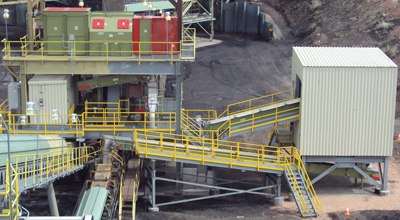 Overall, cross-belts sampling systems can more easily be retrofitted to existing conveyor belts; as a result, the vast majority of the mechanical sampling systems installed today are of the cross-belt design. 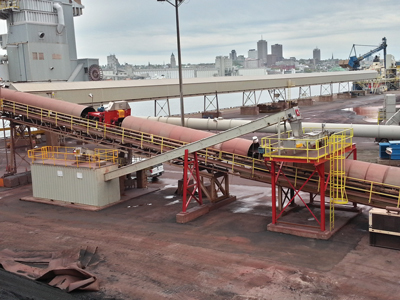 McLanahan takes on coal and coke with an HSS 60HD in Quebec, Canada. How important is maintenance, anyway? The answer to this, according to Sidney, is very — it is just as vital as other facets of the mining process. “Maintenance is critical to sampling system performance, and the design should maximize the ease of access to components for preventive maintenance and repair,” he said. Enhancing safety and access at central areas is as easy as adding electrical disconnects at each component. He noted that, unless otherwise specified, there will usually be only one place to safely lock out the equipment — at the electrical panel — and by placing a lockable disconnect locally at each component, the operators of the mechanical sampling system can quickly and effectively make the component safe to clean and inspect. One point to exemplify maintenance access is a site that provides adequate decking as well as access to the primary sampler, as when that access is not available some primary samplers are never cleaned or inspected. Additionally, on cross-belt samplers, there is a critical wear component on the edge of the primary sampler that wipes the conveyor belt clean of fine particle sizes, Sidney noted. “This needs regular adjustment and cannot be done without access. Due to the lack of proper access, it is the No. 1 maintenance failure McLanahan sees and it is on the most important component,” he said. 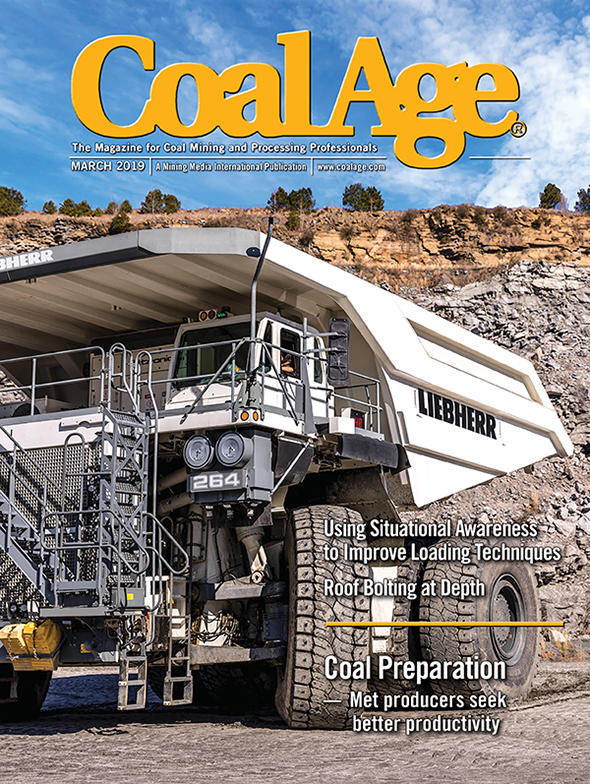 Because the coal sampling application specifically is typically abrasive and corrosive, material movement through chutes and subsequently through sampling systems can take a toll on the equipment over time. Using less robust metals and materials as a way to cut costs will reveal itself in time, he said, as the equipment operating hours mount. McLanahan, which Sidney stressed follows all of the latest ISO outlines as well as regulatory mandates for ASTM International and individual nations’ standards, has had no shortage of positive feedback from those sites that have taken its advice and applied it at their own operation. Global Coal-Resource Fuels quality field representative Chuck Mooney said recently that the HSS system installed at his site approximately two years ago has been a success. He reported that no problems have been reported on the system to date, and while there were a few site issues at the time the system was placed, the company’s engineering team was “a pleasure to deal with” as they worked to overcome it. “I want to thank the entire crew at McLanahan for all of the hard work and time that they invested into making this project a success,” he said. PreviousMining Software: Where Are We Headed?